When humans finally fled the dying Earth they left in their millions: crowded on seed-ships each big as a moon and ready to populate a whole world. . They fled to finally learn that the old words were true. They were not alone. Now humanity is but one species among many in the Cosmic Harmony: an alliance of all the Milky Way's friendly, interested sentients. The Harmony'sspecies - robot and alien, AI and clone - are foreign to one another, children of worlds and histories separated by unmappable distance. But even without maps, they make it work. 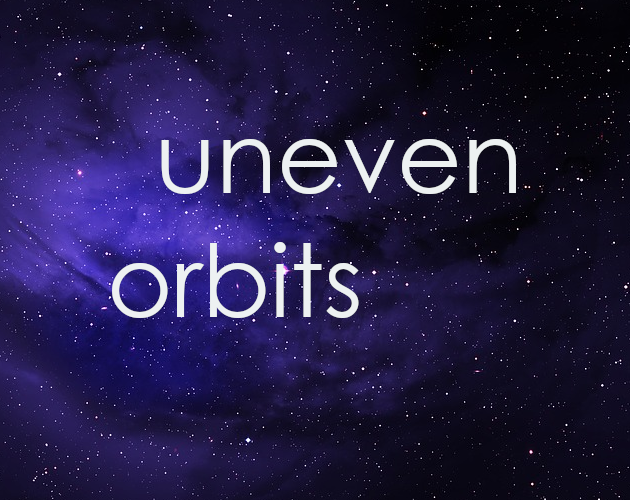 Uneven Orbits is a GMless roleplaying game about a crew, a ship, and an uncertain journey which brings them close (or perhaps tears them apart). It is a game for 3-5 players, and should take between 3 and 4 hours to play. To play, you will need a copy of the game sheet, some index cards, and writing materials. The game is played over a series of rounds each of which centers around a crisis generated from a random table. Players frame scenes around these crises, evolve their characters' Needs, Boundaries, and Longings, and make Memories and change their opinions of one another along the way. Uneven Orbits draws primary inspiration from A Long Way to a Small Angry Planet, but also Firefly, Star Wars: A New Hope, various of the Star Treks, and Alien.